Today I'm welcoming my very dear teacher/artist friend Sarah! I wrote a guest post for her last week - Zip Lock Bag Painting 7 Ways, so being the lovely gal she is, Sarah is returning the favour and has written a guest post for 'teacher types'. She and her boys have been busy making Christmas wrapping paper this week! Thanks for having me Lauren! 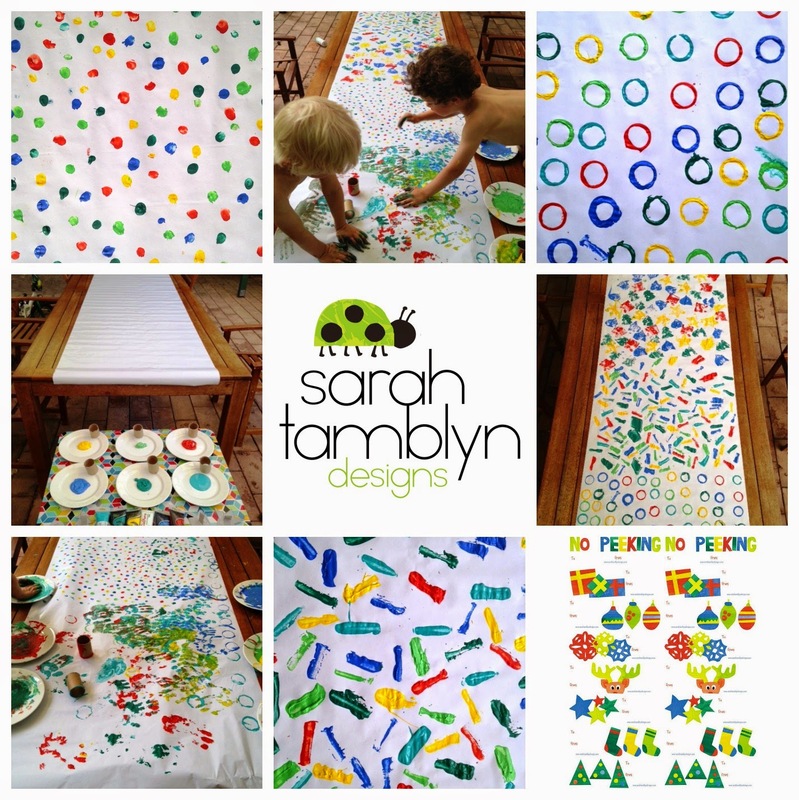 My name is Sarah from Sarah Tamblyn Designs. I design and create fun prints for little people. I also love to have fun with my two young boys and encourage creativity, imagination and mess...(sometimes)! We recently attempted to create our own Christmas Wrapping Paper to go with my Christmas Stickers. Instead of doing individual sheets we went bulk!! I purchased a roll of gloss white wrapping paper and rolled it out on our outdoor table. This allowed me to simply roll it up once the paint was dry, ready to do some wrapping. You can control the painting as much as you choose. I wanted the paper to have a few sections of different patterns, however depending on how old your kids are, you could just give them some paints and let them go for it. We cut out some cardboard Christmas shapes using cardboard from the recycling bin and sliced a gladwrap roll into 5 pieces. For the other patterns we used fingertips and the toilet rolls on their side rather than the circular end. I used the same coloured paints that I used to design this year’s range of Christmas Stickers/Labels. We worked our way up the sheet of paper, doing blocks of patterns. Once it dried, I simply rolled the paper back up, ready for all the gifts that I am yet to organise Have a lovely Christmas, get the children involved and decorate your home with handmade decorations, ornaments and wrapping! 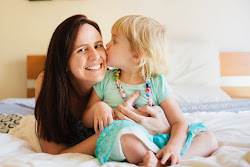 Thanks so much for contributing to my blog Sarah! I once again am amazed at how a little give and take in the blog world can have such positive flow on effects! What a great idea! Seems like a win, win all around! The wrapping paper is fabulous!! Gorgeous! I'm hoping to do some potato printing for wrapping paper this year. I love this idea. I'm just concerned my kids would tear the paper whilst painting it. You didn't have an issue with that? Hi Essentiallyless, this was only cheap white paper and it didn't tear, even with Master 3 launching himself across the table at one stage :) There definitely are cheap and better quality rolls of paper out there and having used it now to wrap a few gifts, I have to be careful that the corners don't tear. There were no issues with tearing during the painting stage though. Good luck! Great stuff! What a lovely way to bond too as a family.